Have you ever truly looked at why people wonder why are preppers crazy? Well, that’s what we’re going to do in this episode. When this episode is over, you’ll stand a better chance of getting the non-preppers in your life on board with preparedness by answering the question, are preppers crazy in a positive manner. All of us understand that when we want people to understand something important, there is a right way and a wrong way to approach them. Unfortunately, when passion like the passion we have for preparedness gets involved, we often find the way NOT to get them to understand us. Actually, we may drive them away from what it is we’re trying to convince them. So, in this episode, I’m going to cover six points that when understood by each of us, will make the act of convincing others to become better prepared much easier. The effect normalcy bias plays. How non-preppers see us as weird. The impact of the surface negativity preparedness causes. What the negative impact of the media is. Are preppers crazy? Many people outside of the preparedness world think just that, that preppers are crazy. Therefore, if we want to figure out how to stop people from thinking we’re crazy, we first need to look at what motivates them to think we’re crazy. 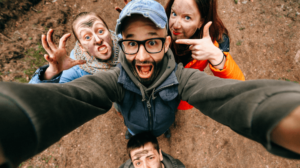 When it comes to motivating people to wonder whether preppers are crazy, these six points provide an insight into how preppers are viewed both individually and as a community. Think about what we must sound like to someone who doesn’t yet understand preparedness. Think about the terms and acronyms we use that may make them question why are preppers crazy. Then think about the conversation where those terms and acronyms are inserted. If you take a step back and look at it objectively, you can’t help but see that we often stick the crazy label on ourselves without even trying. Let’s look at some of the language that we, as preppers use. The End of the World as We Know It. Who listening to this podcast thinks The End of The World as We Know It could be anything other than a depressing, non-fun thought. I mean, even if you’re prepared, the thought, not to mention the reality of, the end of the world as we know it is mind-blowing in the most definitely negative of ways. Let’s really think about it. If we’re talking a true TEOTWAWKI situation, what does that mean? Well, we can either be talking about a lot of death and suffering, or something so revolutionary that we’re super stoked and unable to contain our happiness. The odds are since we’re preppers, we’re probably floating that conversation in a sea of serious SHTF talk. Therefore, there is probably nothing when it comes to be. So, here again, we rack up another point that as preppers, we’re good with. But, for non-preppers, it could be a little bit of a cause for concern. Bug out is a term used by the military to mean that the enemy was on the way, bug out. People also say that someone’s eyes are bugged out. Either way it’s used, don’t have a conversation on it. Bug Out Location: I mean does that sound like a place to be safe, or more like a place where you’d run if the law is chasing you. So, should we really expect people to be comfortable when we tell them that we have a place to hole up if the heat is on? Do we even need to talk about the terms: Bug Out Bag, Bug Out Location, Bug Out Vehicle? Get Out of Dodge. In other words, things are so bad where we live, I’m going to leave with my family to our bug out location, yes, our hideout. Most normal people would probably be a little unnerved if they thought about their town melting down to the point that people would evacuate it. Right or wrong, most people don’t want to think about the destruction of their town. So, what does this all mean? It means that even though our intentions are good, we should consider how we speak with people who are not yet into preparedness. When speaking with people, it’s always a good idea to understand your audience and use terms that they understand and are not overwhelming. Now, I imagine some of you are saying that a disaster is going to be difficult, so people need to toughen up and accept our preparedness terms. Yeah, sure, I got that. However, why throw the baby out with the bathwater? In other words, is your intent to get others on board with preparedness, or is it to try and impress them with your preparedness lingo and knowledge regardless if it drives them away from becoming more prepared. After all, we want others to be part of the solution by becoming more prepared, rather than staying where they are and being part of the problem, right? In case you don’t know, normalcy bias is when someone chooses to not believe something bad will happen, because they’d rather believe that life will continue on as normal, without anything abnormal happening. If you’d like to learn more about normalcy bias and other mindset issues that keep people from preparing, go to mind4survival.com/57 where I discuss how to convince someone to prepare and go over five reasons people don’t prepare. Normalcy bias is one of the reasons you saw stores get cleared out in advance of Hurricane Florence this past week. The people clearing out the stores were, by and large, people who weren’t prepared because they chose not to, due to normalcy bias. That’s because normalcy bias is when someone chooses to not believe something bad will happen, because they’d rather believe that things will continue on as normal, without anything abnormal happening. Unfortunately, there is little that you can do to stop another person’s normalcy bias. That is especially true when a person has no motivation to think another way. Why doesn’t a person have the motivation to think another way? One reason is that the majority of people they interact with think like them. Groupthink tells them that the majority of people in the world believe the status quo will remain the norm and nothing bad will happen to them. Groupthink tells people that not only will nothing bad happen, but if it does there will be someone there to help them overcome the difficulty. That someone may be government, local community, charities, and others. In other words, groupthink, a.k.a. group normalcy bias, reinforces that people only need to be marginally prepared, if any preparations at all. Now, as preparedness minded people, we all know that while three days is a good start, history has proven that it’s not adequate. Just look back at Hurricane Katrina, Superstorm Sandy, and other major disasters. During those events, many people were on their own for a lot longer than three days. Group normalcy bias also helps manifest the mindset that it’s okay to NOT think about disasters and emergencies if they upset you. I believe that group normalcy bias, by its nature, encourages people to feel overwhelmed and overcome by fear at the mere thoughts of disasters. This happens when we overdramatize a disaster. Think about it, what you heard about Hurricane Florence this past week. Heck, even today, some of the headlines on The Drudge report are titled: “Floods of Florence,” “Death Toll, Evacuations Rising…,” “Worst Yet to Come,” “LOOTERS CAPITALIZE ON CHAOS…,” “500K+ Without Power…,” “Wilmington, NC ‘cut off’…,” and so on. Sure, to people who prepare, those headlines reinforce why we prepare and are probably not overwhelming. However, to someone who has yet to embrace preparedness, those headlines combined with the ongoing 24/7 Hurricane Watch news coverage that bombards most people, can be downright intimidating and overwhelming. In other words, it can scare the heck out of people who then, to avoid feeling afraid just ignore the topic of preparation altogether. On the topic of fear, Janis Erickson writes, “Experts agree that fear is a natural emotional response designed to keep us safe and out of harm’s way. However, when someone focuses for too long on an issue they can inadvertently make it worse, creating a phobia.” Now, I don’t know that everyone or even most everyone who suffers from normalcy bias has a phobia, but it sure seems that they just don’t want to think about a disaster. Then again, some probably don’t want to take the time to prepare. But, that’s another story for a future podcast. Sometimes it’s a good idea to look at ourselves as an outsider, non-preparedness minded person’s perspective. I get it, most of us don’t care what others think about us. However, the fact that many of us, including myself can come across as weird should enter our thought process when talking with non-preppers. Well, it should enter our mind if we are concerned with getting others to become better prepared. With that, think about any interactions you’ve had with a gamer. Yes, a full-blown, Dungeons and Dragons, role-playing, World of Warcraft, Everquest, gaming addict. What would you think if you visited a gamer home and they began showing you their odd shaped dice, talking with you about the problems they’ve had with goblins and a very annoying dragon? Maybe they’d energetically telling you about all their incredible online friends and Facebook groups. Perhaps they’d proudly dazzle you with their latest gaming strategies and tactics. As a former gamer, I would probably enjoy the time. However, most people’s minds would begin flashing a nerd alert warning. Then you’d do your best to get out of there, so you could go home to fill your Big Berkey, or double check your bug out bag. Now, let’s flip that script. Suppose that you’re over at a friend’s house for some sort of function. While you’re there, the topic of a recent disaster comes up and you, in a very well-meaning and informative manner begin telling everyone why they need a well-stocked pantry, a cache of firearms, a collection of heirloom seeds, an EDC kit, bug out bags for the entire family, how FEMA camps will become prisons, and the difference between wolves, sheepdogs, and sheep. Odds are, most people will have their nerd alerts siren blaring in their head. In this case, though, it will be the OMG, it’s a crazy prepper alert that will be sounding off like crazy. When that happens, we probably just lost another convert to the preparedness ranks, and instead helped entrench someone further into their normalcy bias. So, remember, how you approach someone about preparedness matters. Coming off sounding like a preparedness minded Dungeons and Dragons addict doesn’t do you or preparedness any favors. It certainly doesn’t help in answering the question are preppers crazy? When you think about it, not only do we often appear weird, but we talk about some very negative things. Now, while we may accept disastrous, end of the world events as simple facts, others don’t necessarily see it the same way. They see a major calamity as something that is dark, menacing, and worthy of their fear. Next, take their fear of the topic and combine that with us, who want to inform others about preparedness. Not only do we talk to them about it by citing reasons to be prepared, such as Hurricane Florence, but many of us do even more. We text them with the latest preparedness news. We forward chain emails about how something bad is headed our way. We repost graphics on social media, and on and on and on. Basically, we end up sounding like Chicken Little. For example, think about listening to or watching Alex Jones. If you take a step back and watch Alex Jones with an objective mindset, what will you see? Will you see someone who is positive and uplifting, or will you see someone who is screaming, negative, and depressing to many? If you can picture that in your mind, then you should be able to picture how non-preppers view you when talking the doom and gloom we talk about. After a while, if you continually go back to talking about the latest disaster, or other preparedness related information, people will begin to avoid you because they’ll wonder are preppers crazy. They’ll stop reading your emails and social media posts. Maybe they’ll avoid you in person. Plus, they’ll probably tell others you’re crazy, over the top prepper, and put them off when it comes to you too. Next, think about the impact the news media has on the preparedness community. So, while the government is telling us to have three-days of food on hand, the news media calls us hoarders for doing that and more. We’re categorized as tinfoil hat wearing crazies. Commentators and others say we shouldn’t need firearms. We get asked why do we prepare if the government will come and save us, and the list goes on. In short, the media uses preppers as fodder to help push their narratives, and in so doing promotes us as crazy, paranoid, and dangerous. Okay, when trying to figure out why people wonder, are preppers crazy, if so this requires us to again step back and look at ourselves and the preparedness lifestyle through non-prepper eyes. We’ve talked about the language we use, how the media portrays us, and the fact that we may, at times, seem weird to others. Also, we’ve touched on the fear people have about disasters, and other emergencies. With that in mind think about how preparedness as a whole comes across to others. Do a simple scan of prepper related websites and their titles. What do you see? You probably see articles about financial collapse, how the coming pandemic will make the Spanish Flu seem like kids play, the future revolution, and supervolcanoes. Now, what do any of you think the chances are that those type of headlines scares people and drives them away? After all, if you have someone in your life that you see as constantly negative, you are likely to eventually pull away and avoid them. So again, it’s important that we all remember to keep an eye on how we appear and sound when engaging with non-preppers. Chances are, most people want to be better prepared, but don’t know how and are also intimidated by the amount and tone of the information that is out there. Heck, think of people who are new to preparedness. How often do you see them suffer from, what I call preparedness panic? Preparedness panic is when a new person gets into prepping, realizes they are not prepared, and then freaks out trying to get as prepared as possible, in as short of a time as possible. The fact that people suffer from preparedness panic tells me that they are people who wanted to become prepared for a while, didn’t know how and are now trying to catch up. Unfortunately, it is how we approach the unprepared that can make or break how they perceive us. If we’re over the top, scary, and weird, we will put people off. However, if we’re gentle and ease the non-prepper into preparedness, the odds of them entering our community and lifestyle are much better than if we beat it into them with a mallet. If you have any other thoughts or questions about Are Preppers Crazy? (Why People Think Preppers are Crazy), please leave a comment below. Thanks for Listening to This Episode on Are Preppers Crazy? (Why People Think Preppers are Crazy). What happens if you’re elderly and can’t evacuate. I used to evacuate for hurricanes when I lived on the coast. As you well know nursing homes have been hard hit by power outages, flooding, etc. and the infirmed can’t really flee. How does one evacuate if they don’t drive, can’t afford a car, etc? I’m always prepared with food and water for at least a week and can cook over open fire. My challenge would be keeping warm should a disaster happen in winter although I have many quilts and warm clothing. I grew up in an era of farming and make do with what you have, but at 79 I’m too old for keeping chickens, or a milk cow. I do have shelf milk, crus of, flour, cornmeal for bread making, which I know how to cook in a skillet over an open fire. I can forage and dandelions make a good salad or cooked if one knows how and also for tea plus it’s healthy. So how do you convey to those, particularly the ones you care about, to prepping? I’ve tried the old remember the ice storm of 95 approach and all I got was stories of how they handled it or friends issues then. I even tried to use those stories for example what if that were to happen again, but, lasted for a week or longer? I usually got deadpan looks or comments such as well I guess were all screwed. Very very frustrating! Have you tried to gradually, over time, use stories of emergencies and disasters in the news to help make your points? With that, I do not mean to drive your points home like a stake into the heart of a vampire. Making a point means taking a small action, or series of small actions, that over time will help raise your preparedness and impart preparedness lessons on your family? Sometimes, if done right, you can turn people into preppers who would otherwise be against it. Just remember, subtleness is key.